There are lots of things you might expect to find on the largest object in the Asteroid Belt. But bright, shiny polka dots are probably not on that list. And yet, there they are! More than 130 perplexingly bright spots on the dwarf planet Ceres! 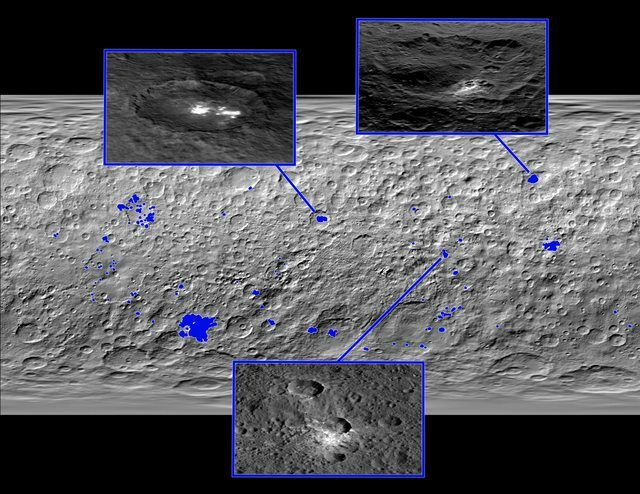 In the months leading up to the Dawn space probe’s arrival at Ceres in March, the pictures it sent back got sharper, and we started to see more and more of those spots. But astronomers weren’t sure what was causing them. Now, according to a study published in the journal Nature, it looks like we have our answer: the spots are probably made of magnesium sulfate, otherwise known as epsom salt. We first talked about the mystery of those bright spots a few months ago, and at the time, researchers thought they might be some kind of salt, but they also could have just as easily have been some other material that reflects light really well, like water ice or certain kinds of clay. So, to figure it out, astronomers looked at exactly how the spots absorb and reflect light. Different compounds have different absorption patterns, called spectra, so in theory they’d just have to match the spectra of the spots to those of the right compound. But of course, it’s not so simple. Each spot is actually a combination of different materials, which makes its spectrum a lot harder to analyze. Still, the researchers were able to get a good idea of what might be in the spots by putting some clues together. The spectrum from the middle of the brightest spot seems to be a close match for a hydrated form of magnesium sulfate called hexahydrite, which is just six molecules of water bonded to every molecule of the salt. The less-bright spots, on the other hand, match better with the version of magnesium sulfate that’s only bonded to one water molecule, called kieserite. But since all the spots match with some form of magnesium sulfate, the researchers think they’re on the right track. That tells us a lot about what’s hiding inside the dwarf planet, because the spots probably formed when other objects — like smaller asteroids — crashed into it, knocking the dark outer layer off and exposing the bright, salty water ice beneath. Then, sunlight vaporized the water, leaving behind only the salt. Which means that if you were to dig just a tiny bit below the surface, you’d have everything you’d need for a nice, soothing bath — as long as you first melted the ice. This Ceres’s map shows the locations of about 130 bright areas across the dwarf planet’s surface.©NASA/JPL-Caltech/UCLA/MPS/DLR/IDA. NASA said in a statement. However, ammonia molecules could be stable if present in combination with (i.e. chemically bonded to) other minerals. So, we’re getting closer to understanding the bright spots on another world. Note: Dawn’s mission, which began with a launch from Earth in 2007, then visited the giant asteroid Vesta in 2011 and 2012, will continue into the first half of 2016. High-resolution imaging, mineral and chemical mapping, and gravity observations are planned from the spacecraft’s final science orbit. ~ ©spaceflightnow.